“New in Canada and unable even to understand the language, Tuyet faces a painful operation to straighten an ankle bent by polio years earlier in Vietnam. Skrypuch continues the story she began in Last Airlift: A Vietnamese Orphan’s Rescue from War (2012), but it’s not necessary to have read the first to appreciate this true story of healing. Drawing on her subject’s reminiscences, the author describes Tuyet’s operation and subsequent recovery with sympathy and respect. Although this takes place in 1975, it seems immediate. Seven-year-old Tuyet secretly dreams of being able to kick a ball and play with other children. As long as she can remember, she has only been able to watch. Shortly after her adoption by the Morris family, a Vietnamese-speaking woman comes to explain that she will be having an operation. After, another Vietnamese speaker visits her in the hospital and gives her a piece of paper with Vietnamese and English words she can point to when she needs something. Otherwise, this brave child endures this frightening experience without the ability to communicate. Her eventual joy at having red shoes that match and, even better, a brace and ugly brown built-up shoe that allow her to stand on her own two feet, is infectious. 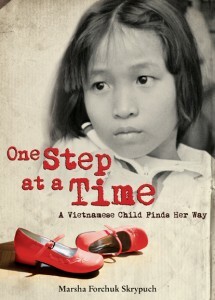 “One Step at a Time is an easy-to-read book about Tuyet, a Vietnamese girl adopted by a Canadian family. It is the sequel to Last Airlift: A Vietnamese Orphan’s Rescue from War and picks up where that book leaves off. Tuyet suffers great pain from having a weak ankle. Just weeks after her adoption, her new family decides Tuyet should have surgery to correct the problem. Tuyet goes through the surgery, learns to use crutches, and takes physiotherapy in the hope of one day being able to walk confidently on her own two feet. At the same time, Tuyet, who speaks little English, is learning about her new family, new home, and new culture and is healing from terrifying experiences in Vietnam. Events that seem ordinary to many Canadian children are extraordinary for Tuyet, and we share her confusion and delight as situations—such as a flaming cake and a pile of pretty boxes, or the passing of a crop-dusting airplane—begin to resolve into meaning. This is a gentle non-fiction telling of a particular period in Canadian history and of the experience of being a new immigrant with health concerns. Notes in the end matter provide some useful context for readers who may not understand the significance of polio or the conventions of narrative non-fiction. Black-and-white photos, including pictures of Tuyet and her family, add to the reading experience. Although Tuyet’s experiences are unusual and sometimes frightening, the narrative is full of love, kindness, and comfort.